I’m not sure how useful these little essays were from an RPG standpoint, but they were fun to write. 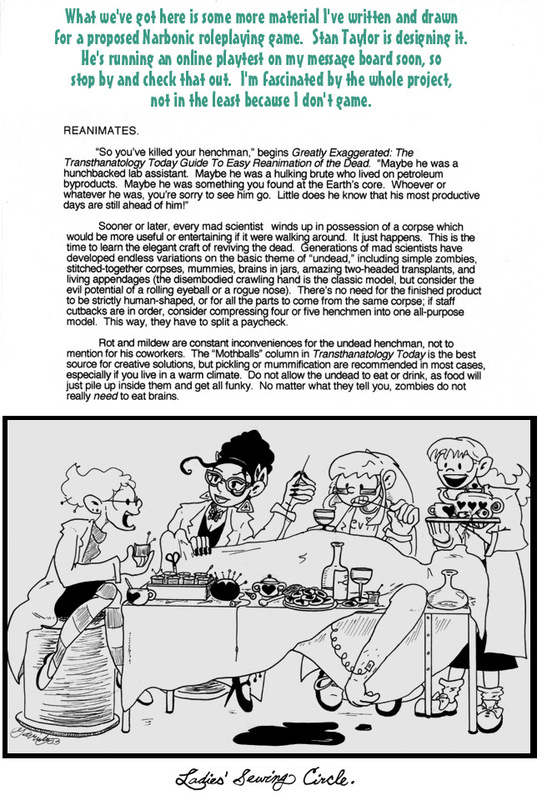 The ladies in the illustration are, from left to right, Phoebe Dimmesdale from Jeffrey Wells’s story Mundementia One; an NPC created by Stan Taylor for the Narbonic playtests whose name I cannot, I’m embarrassed to say, remember; Helen Narbon, natch; and Imogene Frog, a character played by Jeffrey in the Narbonic playtests. Imogene and her henchman Titus, played by Jonathan Towne, eventually scored cameos in a later Narbonic storyline. Dave is under the sheet. The three seated women represent the triple goddess in her personification as the Moirae, spinning, measuring, and cutting the thread of life. Imogene’s tea tray includes a single eye and tooth, a nod to the triple goddess as the Graeae. No, seriously. This is the kind of thing I think is funny. No, its not funny. This is hilarious. Seriously funny, several women engaged in a macabre quilting party. Complete with tea and cookies, on the same table even. I love it. Oh, wow. I didn’t even notice that aspect before! Sweet! I briefly entertained the possibility that this scene might be made even more awesome if the little heart shapes on the cookies were human hearts rather than valentines, but I quickly realized that this would lose the deliciously Hitchcockian tonal contrast. It is my contention that this image is maximally awesome. I dearly want a copy of this game. This is wonderful! I’m going to see if I can wangle the idea into the MSW! Heh. Compare to the riff near the beginning of Gaiman’s The Kindly Ones….Rather than a full-scale RPG, I still think you’d would do better with a lightweight system such as Risus. This illustration is a particularly succinct summary of the Narbonic world and all it entails. You could, and I am not even all that flippant here, replace the entirety of your webcomics’ “about” pages with that picture. Actually, these essays are very useful from an RPG side — they help establish the “feel” of a particular game/setting within the broader genre (how is a Narbonic game different than a Girl Genius game, for a concrete example), and throw out little details like Transthanatology Today that the GM can throw in as side details in his own game to help bring the experience to the players. Is the RPG out there in any form? I’d love to see it, too. If he’s not sewn up just right! Say, “Don’t lose your head! If you really want a game about mad sceince, there is always Genius: The Trangression. It’s a homebrewed Madscience game for the New World of Darkness. I had Hellen and Madblood statted up somewhere. It’s details like the hidden classical motifs in a non-canon image that make your work so perfect! @Thomas: Frankly, Genius is not that great. I was excited about it at first, but the mad science is just kinda like magic, not understanding borne from no loger having to limit oneself by the boundaries of the possible (as mad science almost always should be). The fact that it was made to work with nWoD also means that you can’t actually act like a mad scientist in front of mere mortals. Imogene is so darn cute, I just got to make her next time I play a villains Champions game.